But she is not the only larger-than-life personality who will soon be setting the brand-new stage at Urban Brew studios alight in the third season of this popular talent search. 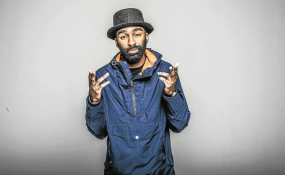 Multi-talented rapper and record producer Riky Rick is ready to bring some swag to The Voice South Africa season 3 as one of the show's four expert coaches. "With his millions of social media followers, unique blend of music styles, offbeat view of the world and wacky sense of fashion, Riky is the centre of attention wherever he goes," says M-Net's Head of Publicity, Lani Lombard. "This flashy trendsetter knows first-hand how hard it can be to make it big in the music industry, and he is keen to share his know-how with the talent on The Voice. We're super excited to see him in action on the show's iconic red chairs." While he may now be a fashionista deluxe, with an impressive list of music success stories - he struggled to build up a following... until he started fusing South African hip-hop with kwaito! His 2014 single, Boss Zonke , became one of the biggest hits of the year. Soon after that he released his platinum-selling debut album, Family Values, which won an MTV Award among many other accolades. Then followed his fashion-and-sapper-inspired 2016 anthem Sidlukotini, the Best Hit Single of 2017. While the music world follows Riky's every move, the man himself regards it as an honour to be a coach on The Voice South Africa. "In fact, my whole family watches the show," he says. "It's so cool to be part of it now. If the talent at the Blind Auditions know what's good for them, they'll pick ME as their coach! I'll give them that extra edge in presentation, execution and confidence... and make sure their voices are heard!" The coaches who will be competing with Riky to hone the skills of The Voice South Africa's phenomenal singers and go on to produce the winner of the season, will be announced later this week. The Voice SA fans who would like to attend the pre-recorded Blind Auditions taking place on 21 and 22 November and 26 and 27 November can secure their seats at mnet.tv/thevoice . Entrance is free, but booking is essential.